I have this theory. 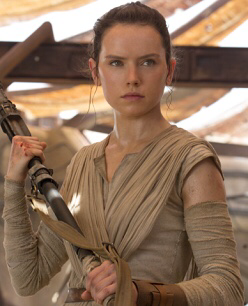 When “The Last Jedi” comes out…I’m hoping Rey is the granddaughter of Obi Wan Kenobi. Here are my thoughts. I’m noticing a lot of parallel themes thought the series..
1. Obi Wan Kenobi was on Tatooine in isolation, watching over Luke …for a long, long time. I’m assuming he found love somewhere along the way, raising Rey’s mom/or dad. It’s possible. Since the Jedi are mostly gone. I can see Obi Wan breaking the Jedi code and getting married. 2. The bigger picture: Obi Wan tries to save Darth Vader from the dark side at least twice; once in Episode 3 and then episode 4. His mission to save his former padawan gets him killed. Now in this new trilogy. Rey has the same mission as Obi Wan. Rey will try to save Ben Solo from the dark side and succeed. Restoring “balance” to the galaxy, again. 3. And building off of #2. The whole series is about the relationship between Skywalker and Kenobi. And I think with this trilogy, it will be no different. It’s all going to reference the prequels, and the Obi Wan/Vader dynamics from A New Hope. 4. Rey and Obi Wan were both in isolation on desert planets. Both have a similar look. Tan robes, etc. 5. This is a big one. In a New Hope, Obi Wan gives Anakin’s saber to Luke. And then Rey also gives the same saber back to Luke 30 years later. The saber “calls to her” because it was in Obi Wan’s possession probably longer than Anakin had it. (Also, Obi Wan disarmed (literally) Anakin for his saber..which means its obedient to him. (Expelliarmus, Harry Potter/The Elder Wand)). 6. Why is there no mention of Obi Wan in The Force Awakens or Rogue One? I would think that even though he is in isolation…he is still helping the rebellion somehow? I think Disney is trying to divert attention away from him being related to Rey. This makes sense to me. And I think if she were another Skywalker… It would be a little too expected.